“Be aggressive!” Appears to be the mantra free agency mantra of the Pittsburgh Steelers in 2019 as they continued to bolster their defense by signing former Los Angeles Rams linebacker/safety Mark Barron. The move comes on the heels of their decision to sign cornerback Steve Nelson and wide receiver Donte Moncrief. If initial reports are correct, Mark Barron’s contract with the Steelers is for two years and 12 million dollars with a $5.75 million signing bonus. 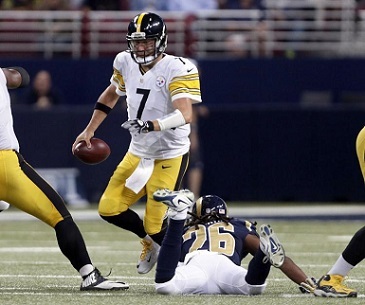 While “Mark Barron” is far from a household name he does have some history with the Steelers, as he was responsible for hit that injured Ben Roethlisberger in the Steelers 2015 win over the then St. Louis Rams. Although Barron’s hit was clearly against NFL rules, he was neither flagged nor fined for the transgression. 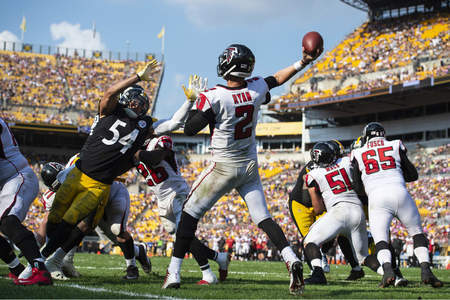 As a result of the play, Mike Vick was forced to start 3 games in Ben Roethlisberger’s absence, with Landry Jones relieving Vick and rallying the team to a comeback win over Arizona. The Tampa Bay Buccaneers drafted Mark Barron with the 7th overall pick in the first round of the 2012 NFL Draft. Mark Barron entered the NFL as a safety, until they traded him to the Rams in mid-2014, who moved him to inside linebacker. Like some other recent free agent signings from past off seasons, Mark Barron comes to Pittsburgh with some injury history, having missed the first four games of 2018, before starting the final 12 including the Rams 3 playoff games. Initial reports indicate that the Steelers will pair Mark Barron at inside linebacker alongside Vince Williams. This could spell bad news for Jon Bostic, who figured to be the incumbent starter following L.J. Fort’s free agent defection to the Philadelphia Eagles. The move could also signal a coming release of Morgan Burnett, whom the Steelers signed as a safety last season. The Steelers plan was to start Morgan Burnett at safety, but injuries led to Terrell Edmunds getting the start, and Edmunds played well enough to keep the strong safety spot for the balance of the season. Morgan Burnett did work his way into the lineup, but as a dime linebacker, a move which prompted Burnett publicly request his release. 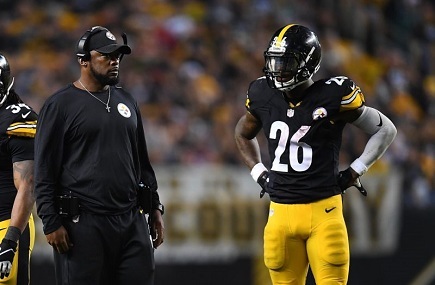 Although the Steelers have now made high-profile free agent signings at inside linebacker, cornerback and wide receiver, Pittsburgh is expected to target all three positions in the 2019 NFL Draft. The moves however, frees Pittsburgh from the need to reach to fill any of the areas on their depth chart. A quick word to the wise: News of the Steelers signing Mark Barron broke on Twitter on Sunday the 17th. By Monday the Post-Gazette and Tribune Review were running the story, seemingly having confirmed Adam Schefter’s report on ESPN. However, as of Tuesday, March 19th at 7:30 am Eastern the Steelers had still not officially announced the signing. While the delay is likely due to logistical issues, it is possible that the deal hit a snag. Back in 2008, the Pittsburgh Post-Gazette announced that the Steelers had signed Bud McFarland. That deal never materialized. However, in that case the Tribune Review had clearly and consistently reported that no deal had been reached with Bud McFarland. The Steelers most aggressive forays into free agency since 1993 continued as Pittsburgh signed wide receiver Donte Moncrief to a two year deal. 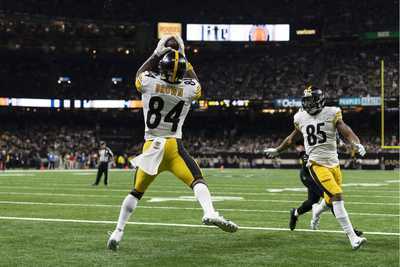 The Steelers were expected to bolster their wide receiving corps following the trade of Antonio Brown to the Oakland Raiders, however many expected them to target the position early in the 2019 NFL Draft. 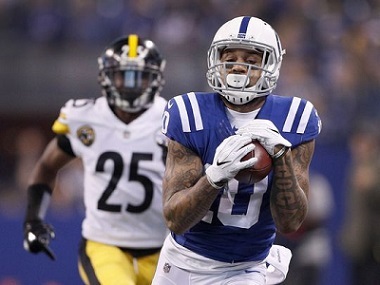 The Steelers had sown interest in Donte Moncrief during the 2014 NFL Draft but did not have a 3rd round pick having traded it away a year earlier to get Shamarko Thomas. Clearly that is one transaction which Mike Tomlin and Kevin Colbert would like have back. Donte Moncrief in fact caught his first touchdown against the Steelers in the 2014 shoot out with the Colts. As Jim Wexell details, Moncief’s other efforts against the Steelers have been far more pedestrian, but that was also the only time he had the benefit of being on the receiving end of Andrew Luck’s passes. While the Steelers clearly would like for James Washington to start opposite JuJu Smith-Schuster, Donte Moncrief will provide the “sophomore” wide out. Rogers Signs for 2 Years, McCullers Back Too? The Steelers took another step to bolstering depth at wide receiver when they signed Eli Rogers to a two year deal. Like Ryan Shazier, Eli Roger’s contract had tolled, meaning he did not acquire enough seniority to reach free agency this year, but the Steelers move will keep Rogers with the team through 2020. Free agency news in Pittsburgh was not all good, however. Reserve linebacker L.J. Fort, who had an under the radar performance during 2018, signed a 3 year deal with the Philadelphia Eagles. L.J. Fort had been on the Steelers roster since 2015, working almost excursively on special teams. 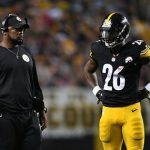 Injuries to Vince Williams gave L.J. Fort’s first prolonged playing experience, and L.J. Fort played well and by the end of the season he appeared to have surpassed Jon Bostic on the depth chart. The Steelers are expected to target inside linebacker early and perhaps often in the 2019 NFL Draft, so L.J. Fort was not expected to start. However, L.J. Fort could have been a quality player at a position that is sorely lacking both depth and talent. The Eagles signed seven-year veteran LB L.J. Fort, who has played for the Browns, Bengals, Seahawks and Steelers, mainly as a backup and special teamer. Fort got a $875,000 signing bonus and base salaries of $1.025 million in 2019 and $1.5 million in 2020 and 2021. While the Eagles are not exactly giving L.J. Fort starter money, it would appear to be above what the Steelers were willing to pay. Although there does not seem to be official confirmation yet, ESPN is reporting that the Steelers have resigned Daniel McCullers two a two year deal. L.J. Fort Played Well for Steelers in 2018. Can He Cash in Free Agency? Promoting Tyler Matakevich who got hurt after a few plays. Calling Sean Spence off of the couch – it was easy to see why was unsigned. Signing Jon Bostic who played well against the run, but in coverage? Not so much. L.J. Fort was a beneficiary of all of these misfires, because they earned him his first real playing time. How well did he take advantage of that opportunity? The bottom line will reveal itself soon as L.J. Fort reaches free agency. L.J. Fort was an undrafted free agent out of Northern Iowa in 2012 and worked his way through several NFL teams–including the Browns, Broncos, Seahawks, Bengals and Patriots — before finding a more secure home with Pittsburgh in 2015. 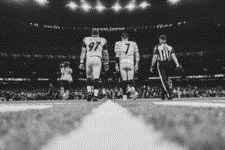 After being used mostly as a special teams player during his first few seasons while dealing with a loaded depth chart at inside linebacker — Lawrence Timmons, Ryan Shazier and Vince Williams ate up the majority of snaps in 2016 and 2017 — L.J. 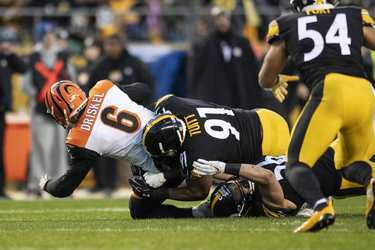 Fort began to see more playing time near the end of 2017 in the wake of the tragic spinal injury suffered by Shazier in early December. 2018 was a minor watershed year for L.J. 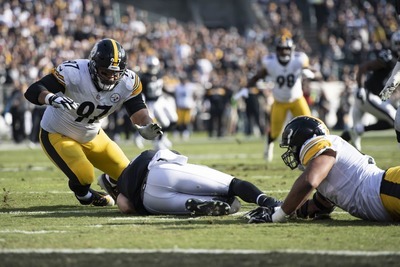 Fort on defense as he saw his playing time increase as the season went along and the Steelers tried desperately to find some way to replace the other-worldly athleticism Shazier once brought to the inside linebacker spot. Appearing in 15 games and starting two, L.J. 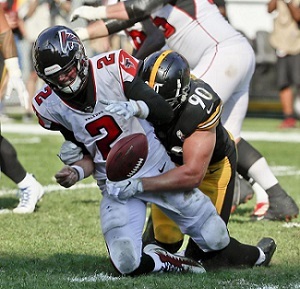 Fort had his most productive season by far in 2018, recording 48 tackles, a sack and a touchdown in the Steelers win over Atlanta. While L.J. Fort did turn pro in 2012 and did bounce around the NFL before arriving in Pittsburgh, he only appeared in 18 games prior to 2015. Therefore, despite being 29 years old, Fort likely doesn’t have the wear and tear on his body that another player his age might. Also, as already alluded to, of all the inside linebackers currently on the Steelers roster, L.J. Fort’s athleticism comes closest to matching that of Shazier’s prior to his injury. Jon Bostic, Tyler Matakevich and Williams certainly don’t possess L.J. Fort’s speed and quickness. In-fact, if L.J. Fort was on another team, and that team was preparing to play the Steelers during Shazier’s prime, L.J. Fort would likely be the guy pegged to emulate him in practice. And given Fort’s age and limited tape, it’s not likely teams will be lining up for his services. In other words, the Steelers could and probably should resign him at a very team friendly price. While L.J. Fort does possess potential, the fact that it still has yet to be realized at this stage of his career may be quite telling. Besides, it’s not all that uncommon for an NFL player to look pretty good in limited playing time, before getting exposed as a starter. Fact is, the Steelers thought so little of L.J. 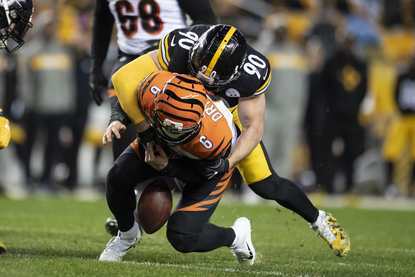 Fort’s abilities after Shazier’s injury in late 2017, they signed Sean Spence off the streets and started him in the disastrous divisional round playoff game against the Jaguars. In reality, it is highly unlikely at this point of his career that L.J. Fort is still some diamond in the rough who will suddenly morph into a dominant linebacker in his 30s a la James Harrison. But that doesn’t mean he can’t be a very good depth player–not to mention a great special teams player. Even if the Steelers go out and sign one of the prime free agent inside linebackers or draft one in the first round, there should still be room on the depth chart for L.J. Fort. And, again, considering the price it would likely take to keep him, I think it’s a no-brainer that L.J. Fort stays with the Steelers in 2019. Taken from the grade book of a teacher who is guilty of some Christmas season-laced truancy, here is the Pittsburgh Steelers Report Card for the loss to New Orleans Saints. Chris Boswell made all of his kicks, including a 48 yarder. Jordan Berry had a 49 yard punting average and did not have a punt returned. The special teams shining moment was a L.J. Fort’s blocked punt, which could have been a game-changer. Critics will second guess Randy Fichtner for going conservative in the 4th quarter after the Steelers took the lead, but if Stevan Ridley holds on to the ball, perhaps that becomes an academic question. In a playoff like situation, Randy Fichtner had the ball in the hands of his best players on offense and, by any measure, they were above the line. Keith Butler can and will take heat for giving up yet another late 4th quarter score. This is something that has been all too common this season. However Butler’s defense held the Saints in check, which is not an easy task. 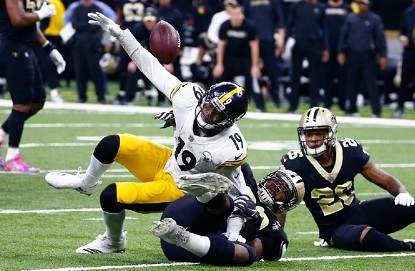 And while the Steelers defense wasn’t able to overcome some very bad calls, they went toe-to-toe with the Saints and no one would have imagined that possible back in September. Mike Tomlin will take heat for calling a fake punt, but he won’t hear of that in these parts. Mike Tomlin made the right decision. It was a risk reward call, and one that is all the more understandable because punting to Drew Brees at that point would have given him the ability to completely kill the clock. In calling the fake punt, Mike Tomlin wanted to ensure that his offense would touch the ball again during the game. He got his wish. 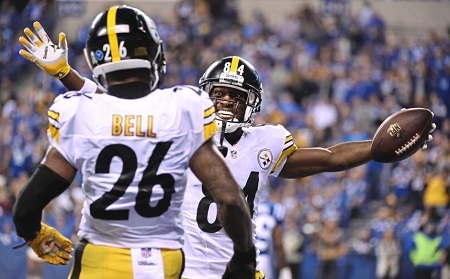 Beyond that, this Steeler team has been shaky and inconsistent during this season. He doesn’t get a lot of ink. He doesn’t make a lot of splash plays. You don’t see him much on ESPN highlights. But against the Saints, other than for his two defensed passes, you didn’t hear his name much. And for a cornerback facing Drew Brees that is a good thing. And for that Coty Sensabaugh wins the Unsung Hero Award for the loss to the Saints. Yet, at the end of the day, it was not enough. It was not enough because the difference between victory and defeat, as it has so many times this season, came down to ball security. I avoid complaining about the officiating and bad calls like the plague. It is not because these issues don’t impact the outcomes of games – they do. But bad calls are part of the game, and good teams, or at least championship teams, find ways to overcome them. That final bullet point isn’t theoretical conjecture – both pass interference calls came on 4th downs. But both calls went for the Saints and the Steelers failed to overcome them, and that’s where this post-game analysis will focus. But first…. It is no secret that the New Orleans Saints are favorites to represent the NFC in the Super Bowl this season. 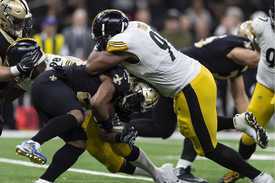 And the Pittsburgh Steelers played like a team which could have been playing to deny the Big Easy their second Lombardi. Antonio Brown was in championship form. His 14 catches for 185 yards and two touchdowns do not do justice to the decisiveness of his on the field presence. I have little doubt that had the Steelers not fumbled on their final drive, Brown could have found his way to the end zone on the next play. JuJu Smith-Schuster also did his damage with 11 catches for 115 yards and proved yet again that the Steelers have a rising star on their hands. Eli Rogers only had one catch, but it was for a two point conversion. Vance McDonald gouged the Saints defense with a 49 yard reception. On defense, T.J. Watt and Stephon Tuitt came up with sacks to force punts in critical situations. Coty Sensabaugh, Cam Heyward, Morgan Burnett Sean Davis and Anthony Chickillo all deflected passes – a skill that too often has been in short supply in Pittsburgh. Chris Boswell hit two field goals and made his other two PATs. Those were all championship-level efforts. But alas, the result likely ended the championship aspirations of the Steelers. New Orleans has one of the hottest offenses in the NFL. The Saints have topped 40 points six times this season and broken the half-century mark once. Giving up 31 points to the Saints at home, especially when the zebras are not calling things your way, carries little shame. But one of the less discussed aspects of the game was the Saints final drive of the 1st half. After the Steelers tied the score 40 seconds remained. Instead of sitting on the ball Sean Peyton remained aggressive, and the Steelers gave up a couple of short passes, before allowing Alvin Kamara to beat Vince Williams over the middle as Joe Haden and Mike Hilton over pursued, opening the door to a 31 yard gain which allowed Wil Lutz to knock in a 43 yard field goal. The Steelers have run similar sub-2 minute drives to close out first halves several times over the last two seasons. This time the Saints turned the tables and those extra 3 points gave them their margin. And two plays after the 2nd phantom pass interference call went against Joe Haden, the Steelers defense also gave up a 3rd and 20 conversion, which is a play you simply can’t let the offense have when defending a 4 point lead with 1:41 left to go. Even so, those defensive breakdowns wouldn’t have mattered, things had broken a little differently for the offense. Immediately after the game, site writer Tony Defeo emailed that to me, which immediately crystalized my thoughts on the game. The 2018 Pittsburgh Steelers have opened themselves to criticism on many fronts. They’ve also had some incredibly bad luck. And they’ve suffered from some incredibly incompetent officiating. Even the lone serious injury they’ve suffered, that of James Conner, came at the position where they could least afford it. (OK, losing Joe Haden would have been devastating.) But all of that would count for naught if the Steelers could have mastered one basic football fundamental: Protect the ball at all costs. 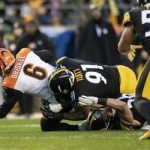 According to TeamRankings.com, the Pittsburgh Steelers have lost an average of 0.6 fumbles a game which ranks them at 23rd worst. But what that ranking doesn’t measure is how costly those fumbles have been. In week 1, James Conner fumbled at the Steelers 18, which the Browns returned to Pittsburgh’s 2, and promptly scoring to get back in the game. Later in the season, Xavier Grimble committed his infamous goal line fumble, whipping a touchdown off the board in a game the Steelres would ultimately lose by 7. Against the Saints, Stevan Ridley fumbled with 10:21 left to play. 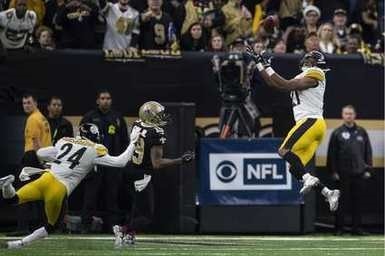 The Steelers defense held the Saints, and L.J. Fort added the cherry on top by blocking the ensuing field goal attempt. But Ridley had fumbled at New Orleans 34 yard line, when the Steelers were broaching field goal territory. The Steelers could have used those 3 points or more. With just 0:41 seconds remaining in the fourth quarter, JuJu Smith Schuster had touched the ball 173 times in his fledgling NFL career. And not even once did he put the ball on the ground. But of course he did just that as he was trying to get extra yards. Only a fool would scapegoat JuJu Smith-Schuster for this error, as JuJu is one player who should give hope to Steelers fans when they look to the future. But it doesn’t change the fact that JuJu Smith-Schuster’s fumble cost the Steelers a chance to pull off a comeback and likely cost them a chance at the playoffs and an opportunity to make a run at Lombardi Number 7. That is an ugly lump of coal to find in your stocking on Christmas Morning, but that’s nonetheless what happened. Taken from the grade book of a teacher struggling with the sobering sight of once star students stumbling toward mediocrity, here is the Pittsburgh Steelers Report Card for the (latest) loss to the Raiders in Oakland’s Black Hole. Ryan Switzer had some decent punt and kick returns, and the Steelers return coverage was solid. None of Jordan Berry’s punts were returnable. All positives. But Chris Boswell missed two field goals. The Steelers offense was bound to be one dimensional, and yet Randy Fitchner came up with a solid game plan given the limitations and his players executed it well enough. As for Keith Butler’s defense, 13 games into the 2018 season what you see is what you get. When the Steelers get pressure on the quarterback this defense is capable of playing with just about any offense in the league. And, as compared to a year ago, the Steelers defense isn’t giving up big plays in droves the way they were. This is a defense that simply cannot be counted on to salt a game away. While a lot of fans are ready to scapegoat Keith Butler, it is entirely possible that Butler is doing well with the talent he has at hand. Hum, “The talent he has on hand” that’s an interesting concept to take into account when evaluating Mike Tomlin’s performance in this game. 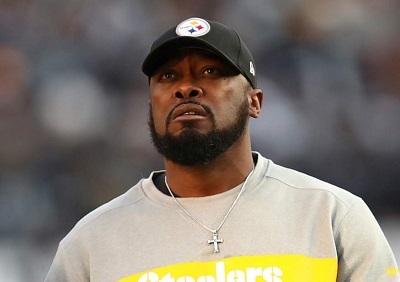 Mike Tomlin is taking heat for his use of time outs when the Raiders were in the Red Zone, but this scribe strongly suspects that Tomlin was giving his defense a chance to “Grow up” so to speak. If that’s the case, then its hard to fault his motive, even if his defense clearly wasn’t up to the challenge. The same cannot be said about Mike Tomlin’s other gamble, namely keeping Joshua Dobbs in the game. Per Mike Tomlin’s own admission, Ben Roethlisberger was “medically cleared to play” when he reached the sideline. Tomlin also conceded that Ben could have come back in the game a series earlier. Being asked to step into James Conner’s shoes cannot be easy, but that is what the Steelers asked of Jaylen Samuels. And while Samuels struggled running the ball, he did quite well as a pass catcher, and really impressed with his second efforts and determination to grind out extra yards. And for that Jaylen Samuels wins the Unsung Hero Award.